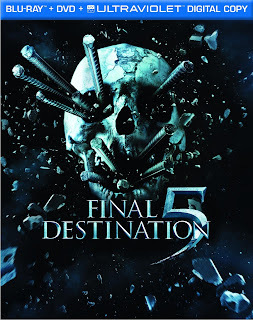 As you might guess from the title, this is the 5th installment in the Final Destination franchise (this one is directed by Steven Quale). Fans of the other films will be familiar with the basic premise - someone has a premonition and prevents the death of themselves and a group of other people, and then Death redresses the balance in the original order. In the case of Final Destination 5, the disaster in question takes the form of a suspension bridge collapse, which makes for some impressive special effects and some very entertaining death sequences. In many respects this film is bigger, glossier and with more effects than the previous ones and the acting is every bit as good as you would expect. The cast includes Nicholas D'Agosto (Rocket Science, Election), Emma Bell (Frozen, Gracie), Miles Fisher (J. Edgar, Superhero Movie), P.J.Byrne (Horrible Bosses, Evan Almighty) and of course Tony Todd (Candyman, The Rock) makes his usual appearance. The story-line is, as ever, predictable in some ways, yet you can never work out exactly what is going to happen. The best thing about it however is that it makes you want to try and that is a sure sign of good writing. There is also a lovely and very unexpected twist at the end (I won't spoil it for you). Special features wise the disc includes a 5 minute video documentary featuring cast and crew entitled Final Destination 5; Circle of Death. All in all a very enjoyable, leave your brain at the door kind of film, ideal for an evening in with a bit of blood and guts. I would recommend this to anyone who has watched and enjoyed the previous films but if you haven't seen them and you're a fan of horror flicks, you should probably watch them first. Final Destination 5 is available to buy now on Blu-ray 3D , Blu-ray and DVD .